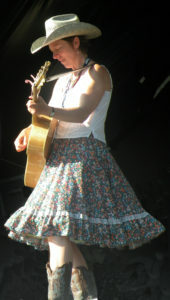 Jody Benjamin was the lead singer in the Toasted Westerns, Ottawa’s favorite singing sandwich, from 1988 to 2008. She is a talented rhythm player and her triangle, rub board and rhythm guitar (as well as harmony vocals) can be heard on many recordings by various artists including: Juno nominee and Maple Blues award winner Michael Jerome Browne , Keith Glass (Prairie Oyster), Finest Kind , and Grouyan Gombo. She currently directs the three Ottawa chapters of Georgette Fry’s community women’s choir, Shout Sister! (shoutsisterchoir.ca). Jody performs with Michael Ball in Ball and Chain & The Wreckers, an Ottawa based band with Michael and Jody as the shackles holding this group together. Formed in 1997, they now have six full length CDs in their catalogue. Their latest release, Surrender, from 2014, is their first CD with all original songs. Louisiana Love Bug, from 2009, was recorded, produced and mastered by Dirk Powell in Louisiana. Dirk is well known for his work with people like Joan Baez, Jack White, Loretta Lynn and T. Bone Burnett. Dirk assembled some great Louisiana musicians for the Ball and Chain recording. Michael and Jody formed a Zydeco band called The Vanier Playboys in 2016 and are just putting the finishing touches on their first recording. Michael and Jody have been making frequent trips to Louisiana since 1997 and the music from Southwest Louisiana and its cultural context continues to fascinate them. They play a mixture of Roots Country and Cajun music, always with the dancers in mind.